According to the National Veteran-Owned Business Association, more than 3 million men and women who have served in the U.S. armed forces have started their own small businesses after their military service. They are called vetrepreneurs. In honor of Veterans Month, we are sharing the story of one of Wichita’s vetrepreneurs: Lance Minor, founder of Aero Plains Brewing. After 21 years as an operations and mobility planner for the United States Marines, Minor retired in December 2012 and returned to his hometown of Wichita with his wife and two daughters. His transition, though, had been in the works for years. His dream was to turn his home-brewing hobby into Aero Plains Brewing, a production and packaging brewery in Wichita. Before retiring, he participated in an apprenticeship program sponsored by Camp Pendleton and the local chamber of commerce in Carlsbad, California. Research shows that the success rate of veteran-owned business startups is almost twice that of other business startups, and that success is often attributed to the qualities instilled in military personnel that transfer to the business world: dedication, discipline, service before self, drive and teamwork. Minor said the planning skills, self-motivation and sense of service to community that kept him in the military for 21 years were critical to keeping his entrepreneurial dream alive while he worked a full-time civilian job writing educational course copy until he and partners Ryan Waite and Brent Miller could raise the money needed to start brewing operations. Aero Plains Brewing joined Wichita’s craft beer scene in 2016, opening a facility in historic Delano District where they brew “well-balanced and approachable” beers. Visitors are welcome to tour the facility and spend time in the tasting room, which has indoor and outdoor seating, games and often features local artists, entertainment and food trucks. 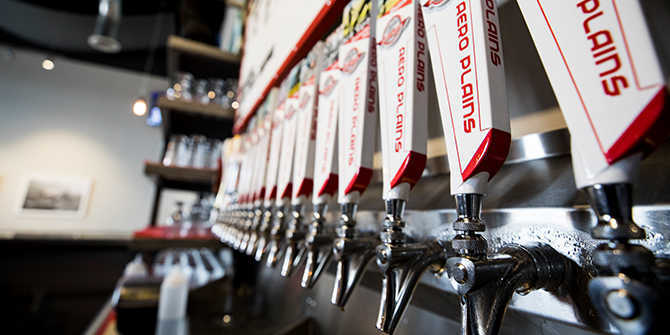 Their two flagship craft beers are always on tap – Dove Runner Red Wheat and Bingo’s IPA – along with as many as 10 rotating selections with names that reflect their Delano location. They like to say their craft beer is brewed at the crossroads of history and innovation, where the Chisholm Trail meets the runways of the Air Capital of the World. The tasting room has become a popular hangout for locals and visitors, serving as a cultural focal point for arts and music and supporting community organizations, from Starkey, which serves people with intellectual disabilities, to pet adoption programs. Aero Plains was named Best Kansas Brewery at the 2017 Midwest Beerfest. Their craft beer is on tap in more than 40 area bars and restaurants and bottled, as well, for sale in most local liquor stores. Stop in during Veterans Month to meet Minor, try his beer and thank him for his service. Thank you to all of America’s veterans and their families for their patriotism, love of country and willingness to serve and sacrifice for the common good. For 98 years, Americans have remembered those who served our country in uniform on Nov. 11 – first as Armistice Day and then, since 1954, as Veterans Day. In this 99th year of commemoration, the Department of Veterans Affairs is broadening that tradition of observance and appreciation to include both veterans and military families for the entire month of November. Wichita’s Veterans Day parade is set for 11 a.m. Saturday, Nov. 11 through downtown and will end with a celebration behind WaterWalk Place. There you can meet parade participants and view vehicles and other memorabilia displays while listening to patriotic music. Food trucks will be selling food.